As we have discussed in earlier blog posts, there are certainly many things that a grant applicant must consider in writing his or her proposal. Probably one of the most important things that we suspect that most applicants have never thought about is the relatively trivial question: “Why would a reviewer actually read your grant application?” There are, of course, lots of answers to this question with many applicants responding “Because they’re interested” (a positive expectation); “Because they want to find something wrong with it” (a negative expectation); “Because it’s in their field” (unlikely). Occasionally, a respondent will come close to providing the correct response by answering “Because they’re on the review panel”. This is, of course, not the actual reason they would be reviewing your grant application, but it does set up the correct answer. When pushed to pursue this line of thinking further, eventually the correct, and relatively simple, answer invariably emerges, namely that “They have to!”. A reviewer reads your proposal for one, and only one, reason: because they have to. By agreeing to serve on the review panel, your application is one that has been assigned to them by the organizers of the review and 99% of the time, they have no choice. While acknowledging that a reviewer would have the option of not reviewing the proposal because of a perceived or actual conflict of interest with respect to the applicant, or because it might be too far afield from that reviewer’s area of expertise, in the vast majority of cases the reviewer simply accepts the responsibility and is “stuck” reviewing your proposal. This answer, however, merits some additional consideration, in large part because it lies at the heart of why many grant applicants fail. The principle involved here is an essential part of human nature, namely that most individuals would agree that is significantly more difficult to partake in an activity that one has to do, as compared to participate in in an activity that one wants to do. As a consequence, the underlying motivation for a reviewer to read your proposal is relatively low to begin with. On top of that, the great majority of applications assigned to reviewers (anywhere from 75-90%) are usually not directly related to the reviewer’s own area of interest, thus further reducing the underlying motivation. Fortunately, most reviewers are able to provide good insight into strengths and weakness of applications, even those not directly in their field. If all of these barriers were not sufficient, the surprising observation, at least to this writer, is how many applicants appear to never consider this fundamental aspect of the review process when preparing their grant application. For example, when applicants are asked to choose between two font sizes of a document they have been assigned to read, more than 90% would choose a document written using 11-point font, relative to one written in 10-point font. Yet half of those same applicants are likely to adopt a 10-point font for the preparation of their own application. Why anyone would ask others to do something that they personally would elect not to do is a great imponderable. Similar examples could be provided for decisions regarding the inclusion of line spaces between paragraphs, size of margins, size of charts, figures and diagrams, etc. All of the above collectively constitute elements of “reader friendliness” that are so important to engaging that reviewer who is reading an applicant’s proposal because they “have to”. 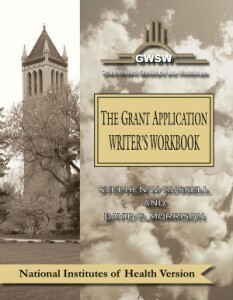 Close attention to doing everything in an applicant’s power to provide a document that is maximally “reader friendly” is one of the unwritten rules that we have tried to stress in each of our versions of The Grant Application Writer’s Workbook. If an applicant is paying attention to this usually unwritten aspect of good grantsmanship, it helps a reviewer to actually read the applicant’s entire proposal (and there is, of course, no guarantee that the reviewer will read the entire proposal) which could make the difference between funding and no funding. Of one thing we can assure our readers; if a reviewer does not read an applicant’s proposal, one can be absolutely certain that that reviewer will not be likely to serve as an advocate for that proposal at the review panel meeting!